Can I update my invitation details after I have sent the invite to guests? Yes! If you need to make changes to your design or invitation details just head over to your account Dashboard and click the green Manage Invitation button for your event. On your Manage Invitation page, choose the Design & Details button. This will take you to the back into the design editor where you can make any necessary changes. 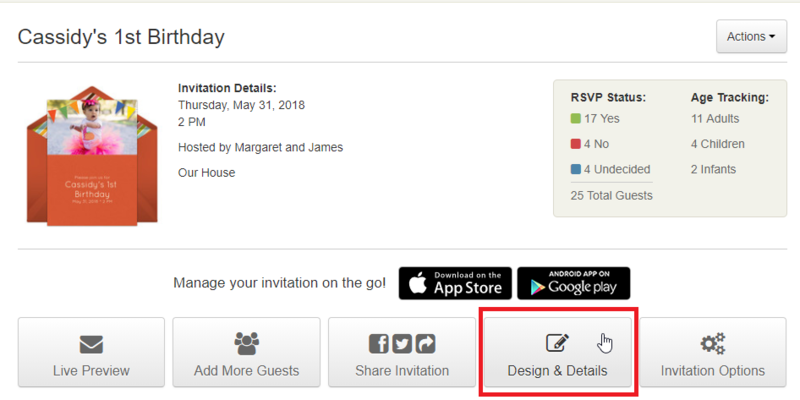 When you're finished, just click on the green Save button and your invitation will be automatically updated for your guests. To update your invitation details in the mobile app, first, tap on the My Invites tab and select your invitation. Next, select the Edit Invitation option. This will also take you to the back into the design editor where you can make any necessary changes. When you're finished, just click on the green Continue button and then the Finish Editing button on the next screen. Your invitation will be automatically updated for your guests after that.